Exactly one year passed since the Mi Max 2 was released so fans are understandably eager to see its successor, but in the latest Weibo post, Xiaomi's CEO Lei Jun said that the device is still not ready and we will have to wait until July. 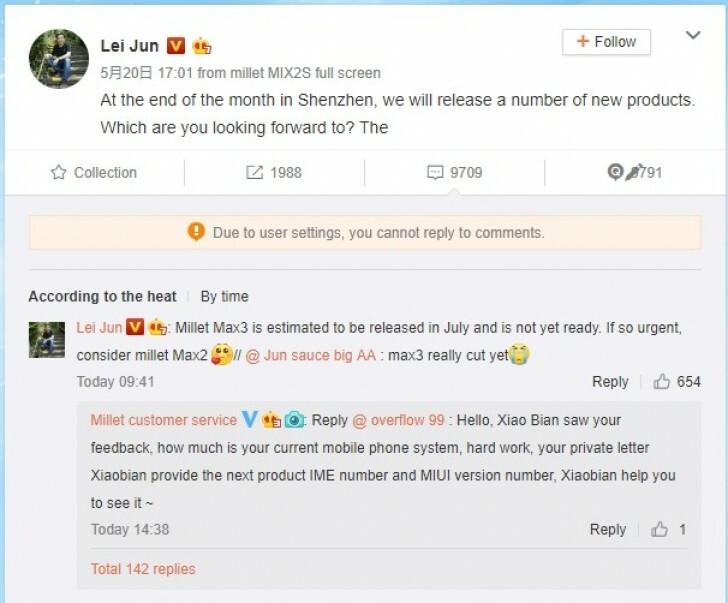 There was an outside chance that we'll see the Mi Max 3 towards the end of this month when Xiaomi is holding an event for some of its products - the Mi 8th Anniversary Edition flagship and Mi Band 3. That's obviously not happening though and we are in for some more waiting. Anyway, the Mi 3 is expected to deliver some interesting features like wireless charging, iris scanner and a humongous 5,500 mAh battery behind its humongous 6.99-inch screen. Earlier reports also claim that the device will sport Snapdragon 635 SoC and a dual-camera setup on the back.